Description: Our mix makes an authentic savory salsa with onions, red & green bell peppers, garlic, and Tex-Mex herbs & spices. We've made it ultra-hot by adding Trinidad Scorpion Pepper (the 2nd hottest on the planet) and Habanero Pepper (the 4th hottest on the planet) for a very spicy salsa experience. Features: All natural ingredients. No added MSG. Gluten Free. Vegan. Made from scratch, in small batches, from our own original recipe in Ohio. Serve with: tortilla chips, Bugles, veggie sticks, pretzels, and use as a Mexican condiment on tacos, burritos, etc. 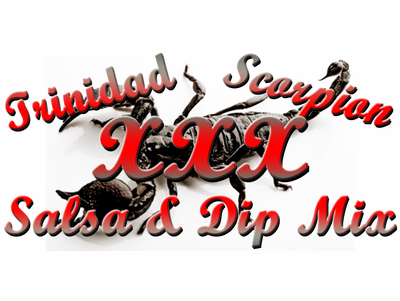 Ingredients: salsa base (onion, red & green bell peppers, garlic, herbs & spices, chili powder) sea salt, scorpion, habanero pepper. Packaged in a facility that handles wheat, milk, soy, egg, peanuts, and tree nuts. Colorful and zesty cold appetizer. ~ With an electric mixer, beat together cream cheese and Salsa Mix. Fold in olives and peppers. ~ With a butter knife or spatula, spread mixture, about 1/8" thick, evenly onto a tortilla. ~ Roll up tortilla tightly and set aside. ~ Repeat with remaining ingredients until you run out of spread. ~ Using a sharp knife, slice rolls into 1" sections. Wipe the knife blade with a damp kitchen towel or paper towel every few slices. ~ Arrange rolls close together on a platter, stacking in a pyramid shape if necessary. ~ Refrigerate at least 2 hours before serving. Note: Tortillas are more pliable when at room temperature. Fast and easy, this classic party food will disappear quickly! Serve with corn chips or tortilla chips for dipping.